This ground floor, two bedroom oceanfront condo at the Kihei Surfside Resort is located at the ocean end of the building, in the coveted "1 stack", which are the closest to the ocean two bedroom condos in all of Kihei or Wailea. It has 830 sq ft of living space, not including the lanai. It has a spectacular 270 degree view from the kitchen, living room, dining area, master bedroom and lanai. 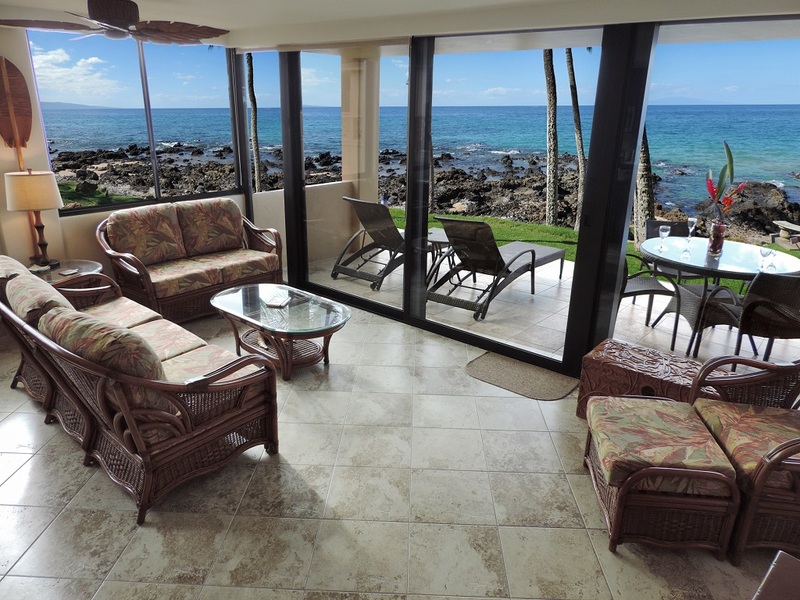 The lanai opens onto emerald green grass, and overlooks the rocky point which shelters Keawakapu beach, which starts 100 steps to the south and stretches for a mile toward Wailea. The islands of Molokini and Kahoolawe are clearly visible. The view of the ocean and its abundant wildlife is absolutely breathtaking. It was completely remodeled and refurnished in November 2015, and is spectacular in every way! This is one the finest units, in the best location anywhere in south Kihei. The entire unit has porcelain flooring. All the cabinetry, which was custom made and imported from Canada, is cherry stained maple, and all counters and vanities are topped with granite. All lighting in all rooms is controlled by dimmer switches. The gourmet kitchen is spectacular! There are large windows through which there is a spectacular view to the south of Keawakapu Beach, (voted Maui's "most romantic, where there are dozens of weddings each year), Molokini Crater and the island of Kahoolawe. It is fully equipped with stainless steel appliances, including side by side fridge/freezer with ice maker, flat top stove with five burners, quiet dishwasher, multi-function microwave oven, garbage disposer, under cabinet lighting and a variety of small appliances including coffee maker, coffee grinder, four slice toaster, blender, crock pot, rice maker and hand mixer. There is also a large selection of higher end pots and pans, baking pans, knives, BBQ tools, extensive spice rack and ample matching dishes, glasses and cutlery. The kitchen peninsula has a six foot eating ledge with two barstools. The living room has a tropical rattan sofa with a matching loveseat and large comfy armchair with ottoman. There is also a large 55" flat screen LCD HD color TV with HD cable box, DVR, Blue-ray player and surround sound receiver and multi speed ceiling fan. The dining area has a round rattan glass table with 4 matching tropical armchairs with ceiling fan/light above. 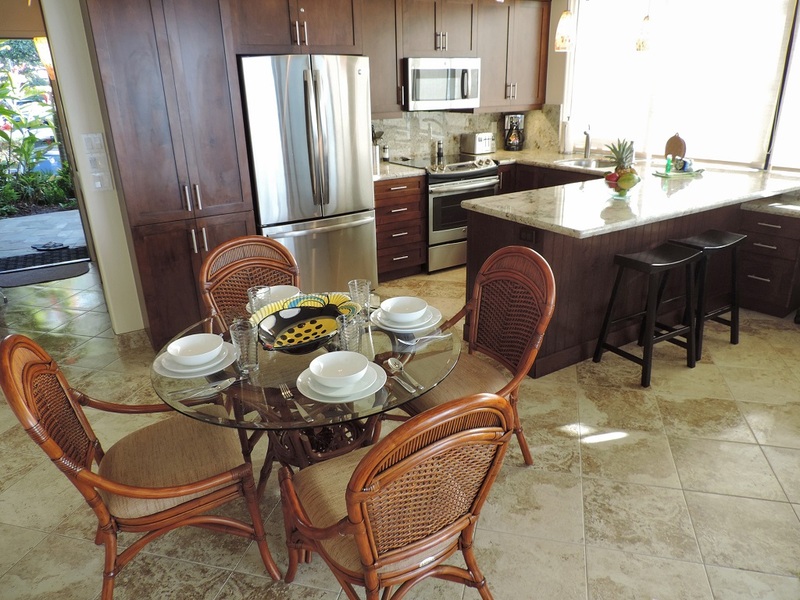 The oversized lanai has two matching lounge chairs, and there is a full size patio table with seating for four - a spectacular place to enjoy your morning coffee or a romantic oceanfront dinner! Turtles and dolphins can be seen year round, whales in season. The unit has free, wireless high speed internet and free long distance calling to the United States and Canada. The master bedroom has a high quality Euro style pillow top king size bed with high end linens. 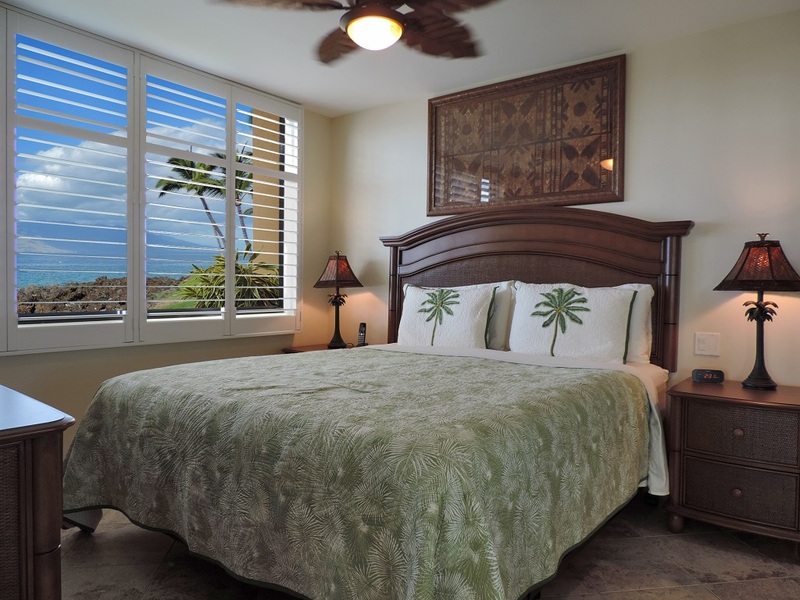 This is one of only two, 2 bedroom unit at the Kihei Surfside with a king size bed. There is also a multi speed ceiling fan, Hawaiian style rattan furniture, plantation shutters, wall mounted 40" flat screen LCD HD TV with cable box. The closet has a digital security safe mounted inside. The master bedroom is located on the ocean side of the building from where the surf is very audible and the full ocean view is breathtaking! The master bathroom has a full size, walk in shower. There is an over height vanity with granite countertop, elongated toilet. The second bedroom has Sealy Posturpedic pillow top Queen size bed with high end linens. There also is a multi-speed ceiling fan, Hawaiian style rattan furniture, plantation shutters, closet, and a wall mounted 32" flat screen LCD TV with cable box. This bedroom also has a full bathroom, including custom enclosed glass shower with a massage head shower system, c/w a hand held wand/massager. There is an over height vanity with granite countertop and elongated toilet. The unit is fully equipped with, fresh linen and towels, iron/ironing board, hairdryers, beach chairs, beach towels and a cooler. Umbrellas, boogie boards and snorkel gear are not supplied, but are often left behind in the units by other guests – no guarantees. This unit is an excellent choice for guests who are looking for a very high end, premium oceanfront accommodation in a spectacular location with an absolutely breathtaking and unobstructed 270 degree view of the Pacific Ocean from Keawakapu Beach to the West Maui Mountains.